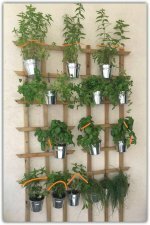 Pruning Basil – I would like to show you two different types of basil plants that need to be pruned. One will be a young plant, and the other (yep, you guessed it) an old one. And I deliberately grew this basil wild and free, without paying it much attention or caring for it for almost a year. (Well, I did care, I just didn’t show it...) Anyway, the point was that although the basics will remain the same, there are differences that are important to understand. Let’s prune! 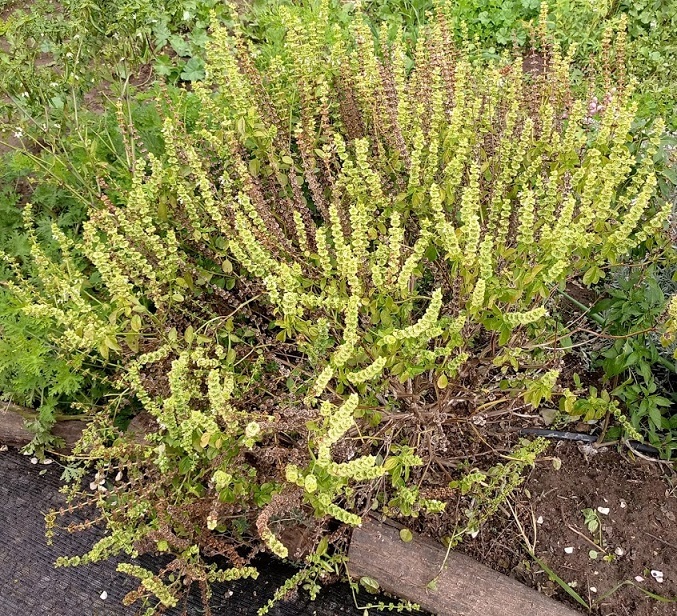 Before you prune – The first thing to know is that if your basil is in the white blossoms stage, enjoy the flowers while they last, but as soon as they begin to dry cut them off. Basil flowers reduce the growth of new leaves. So enjoy them while they last and cut them off before they die. When? With both and older and a younger plant, pruning will take place between early spring and up to six weeks before frost sets in. How and where? Now this is fun! These are my neighbor’s hands – Mr. Roni. He has been growing basil for almost 45 years (!!) He never uses pruning shears for his young basil plants. He simply searches for the spot where he can see new leaves growing and then breaks the stem just above. Of course you can use pruning shears and make a cut at the same spot, but this takes the meaning of hand pruning to a whole new level. Where Roni’s lower thumb is – that’s the exact braking point. Try it! 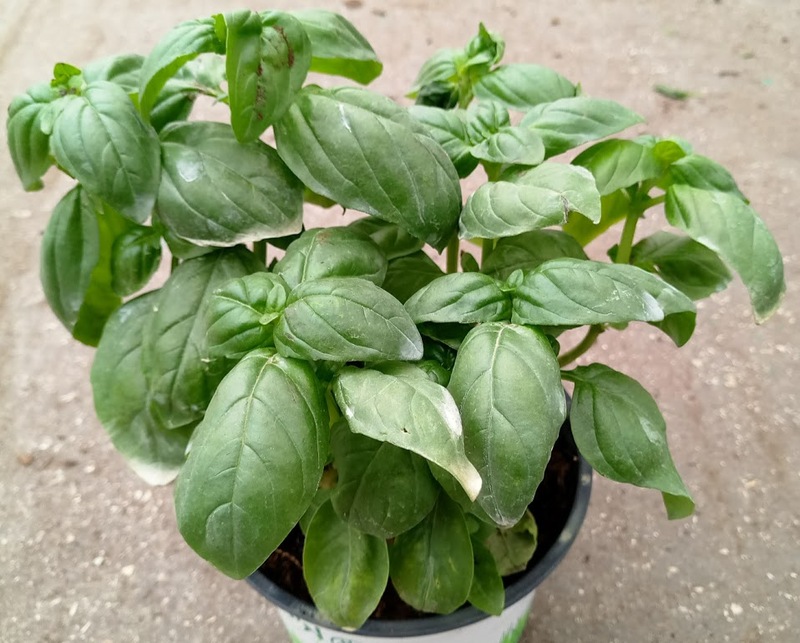 Before pruning basil – First things first, my old looking basil is in desperate need for some tender loving care, and what I said before about cutting off the white flowers applies to both new and old basil plants. Regarding the ’when’, early spring and until six weeks before the frost sets in. BUT, there can be no (real) hand pruning here. For older plants you will need to use shears. As you can see, this old looking basil plant has woody looking naked stems, shrunken leaves, a fairly ugly shape (let’s be honest here), and dried flowers & stems on its upper part. This plant is in desperate need of some TLC and I am about to give it to him. 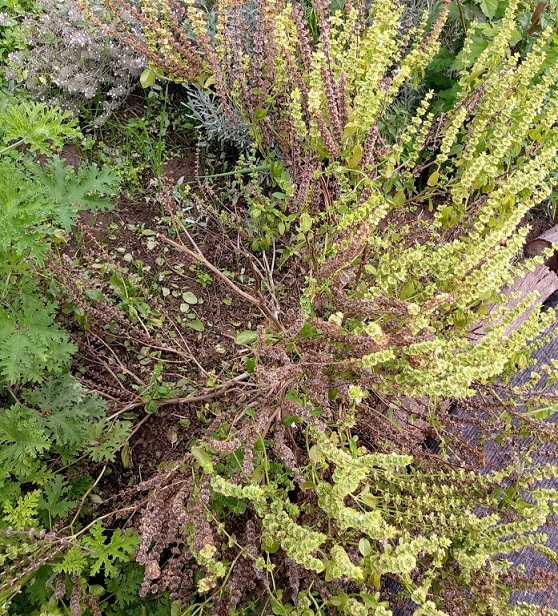 Step 1​​ - naturally, you can't prune the whole shrub at once. Going in too hard will just make it suffer, and it could potentially even die. So, prune in stages. First pick the side of the plant that you will NOT be pruning at this stage. Yes, half of the plant will remain unattractive for a little while longer. Step 2 – Now that you have chosen a side, scan the stems from the bottom up and search for the "green spot" (that’s the place where you will notice one more new leaves are about to come out - these are the buds). 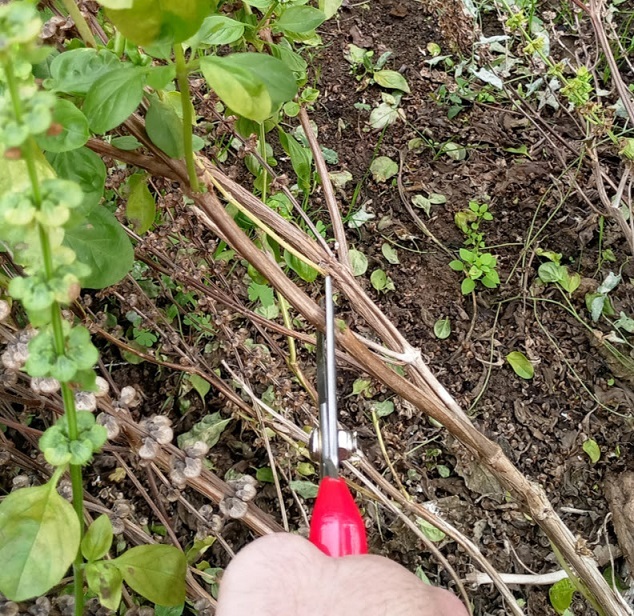 Use your pruning shears to cut half an inch or so above the bud, and repeat the same process with few more stems – all on the side you chose to prune. Once that side is done – you’re done. Step 3 – I warned you, it’s not looking good… but I promise that in a few weeks it will get better. What will soon happen is that new leaves will begin to emerge just below the point where you made the cuts, and that side of the shrub will slowly get covered in new growth. When you see the pruned side has grown new leaves and recovered, you can prune the other side. When pruning the basil plant, regardless if it’s old or new, lives indoors or outdoors – the process is exactly the same. For pruning basil, my preferred pruning shears would be bypass pruners. They can handle the woody parts (the low dried stems) as well as the soft upper branches of the plant. 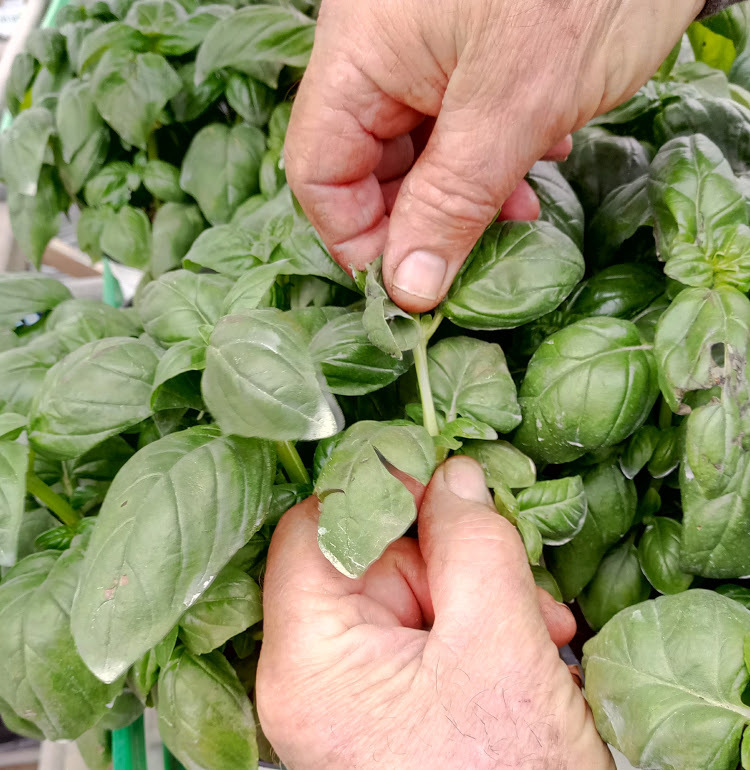 Of course you can always use two different kinds of shears, but if you chose to do so, remember that the basil’s woody stems are actually soft on the inside.